Searing fish may seem daunting, but once you master it, it will be second nature! Make sure the pan is hot and well coated with oil. Put the fillets with the skin side-up, you’ll hear a sizzling sound. Let the fillets cook, leaving them for a few minutes. (It’s how you get that delicious crust!) Gently lift a corner of a fillet with a spatula. If it is easily released, it is ready. If not, allow it a little more time. Flip the fillet, cook a few more minutes to get crispy skin and cooked fish through, and you’re set! 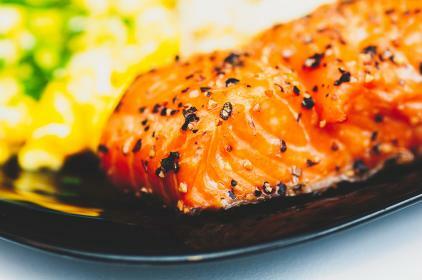 This incredible salmon recipe will be loved by everyone. It's tasty and filled with healthy benefits of honey. In a medium bowl, combine honey, lemon juice, soy sauce and red pepper flakes. Heat two tablespoons of oil in a large skillet over medium-high heat. When the oil is hot but not smoking, add the salmon skin-side up and season with salt and pepper. Cook salmon about 6 minutes until golden, then flip over and add the remaining tablespoon of oil. Add the garlic to the pan and cook about 1 minute until fragrant. Add the honey mixture and the sliced lemons and cook until the sauce decreases by about 1/3. Baste the salmon with the sauce. Garnish with slices of lemon and parsley to serve.